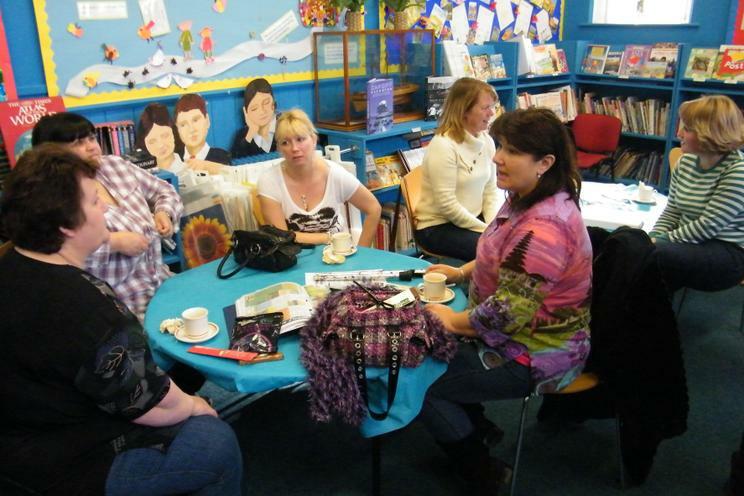 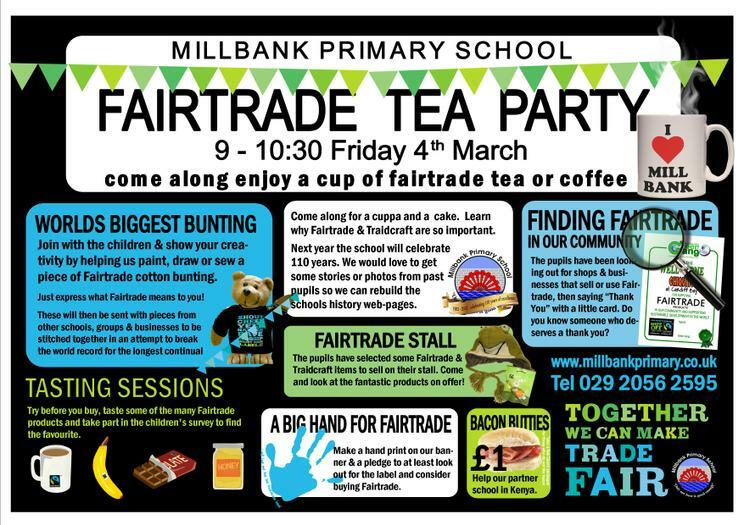 On Friday 4th March we invited members of the community to come and celebrate Fairtrade Fortnight with us at our Fairtrade Tea Party. 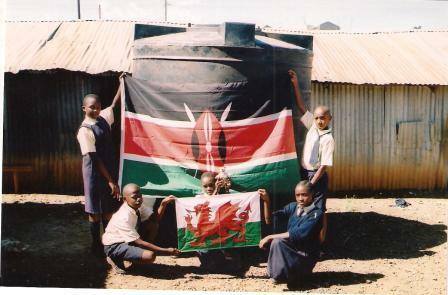 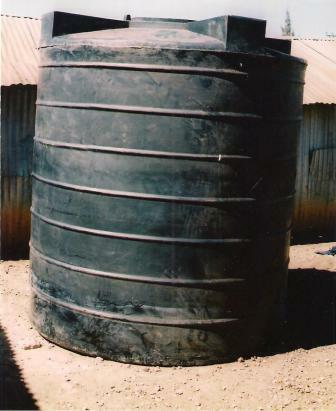 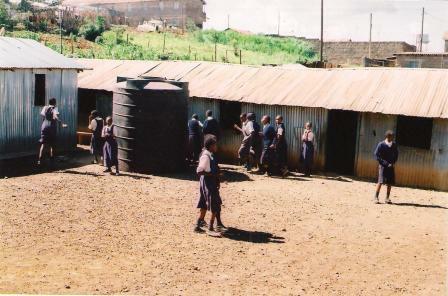 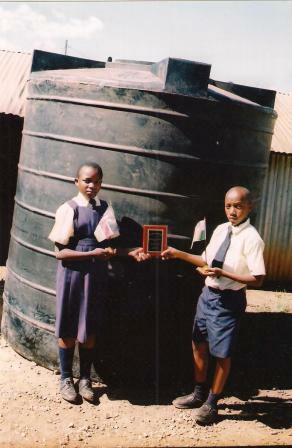 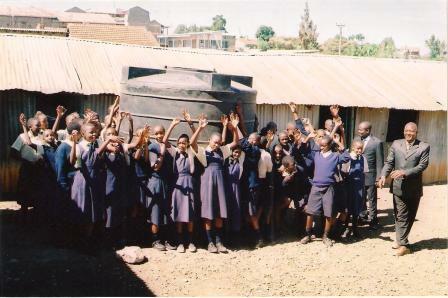 We used the money that we raised not for ourselves but to help our friends in the AMAF school in Nairobi Kenya with the purchase of a much needed Water Tank that will ensure that the children can concentrate on their studies and have fresh clean water available for cooking and drinking when it is needed. 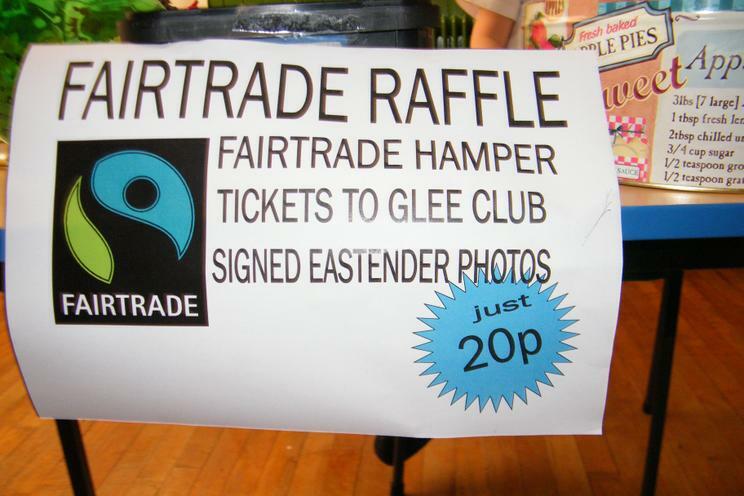 But every time you buy a Fairtrade product it does a similar thing helping people in developing nations. 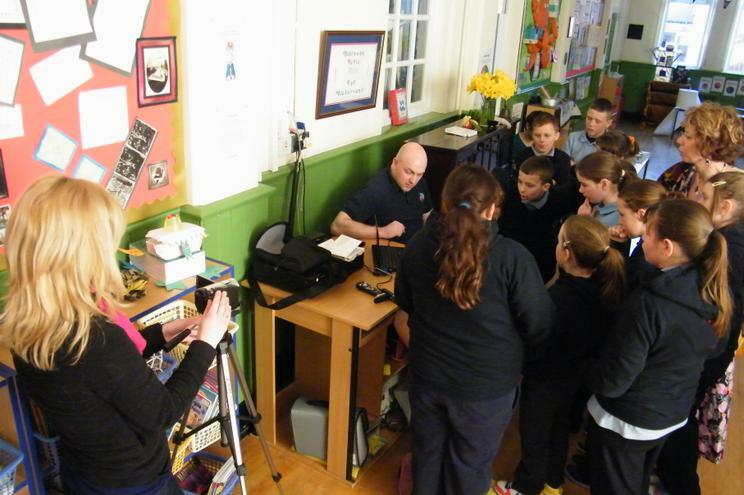 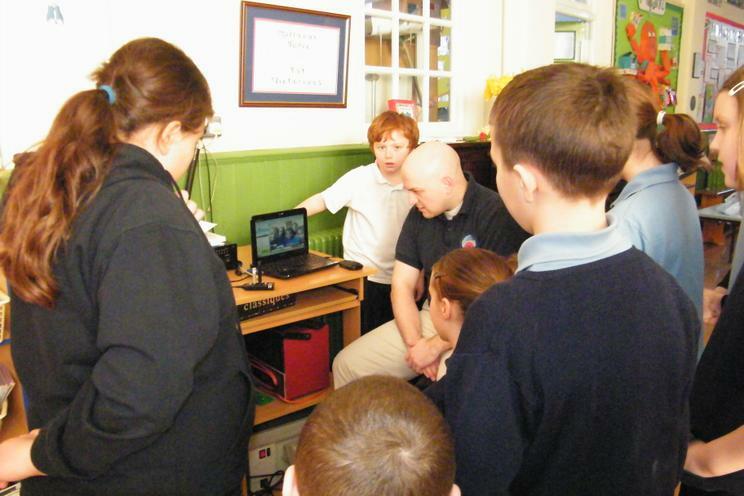 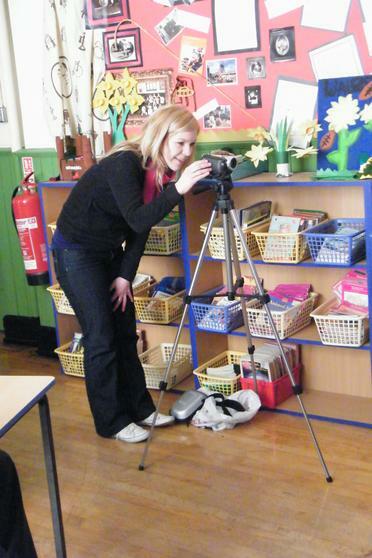 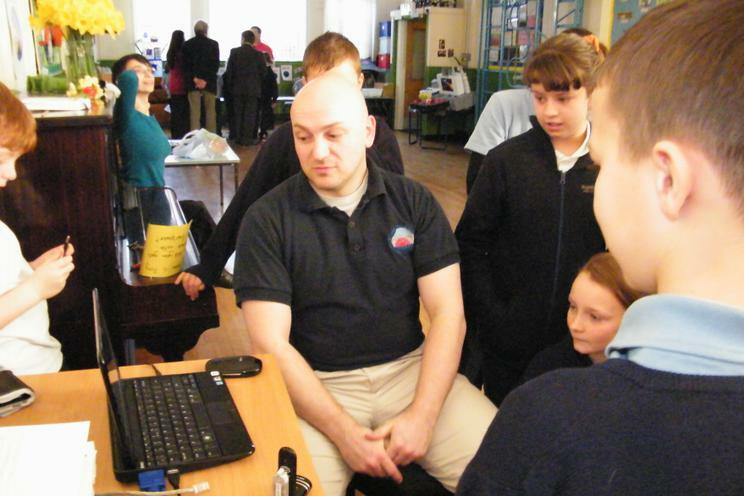 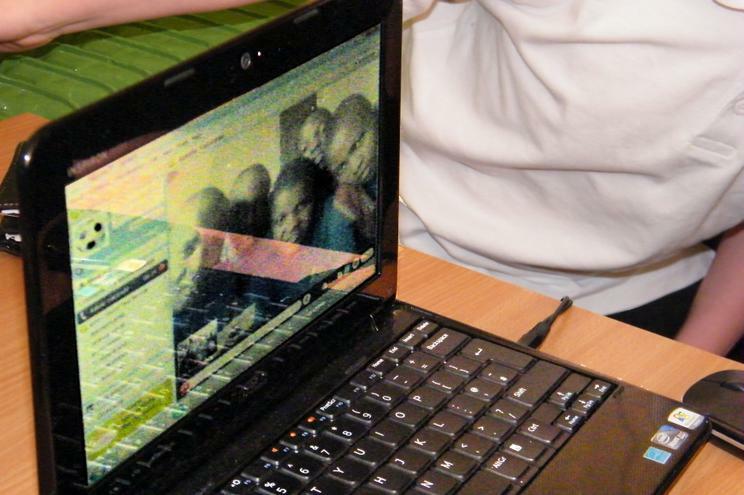 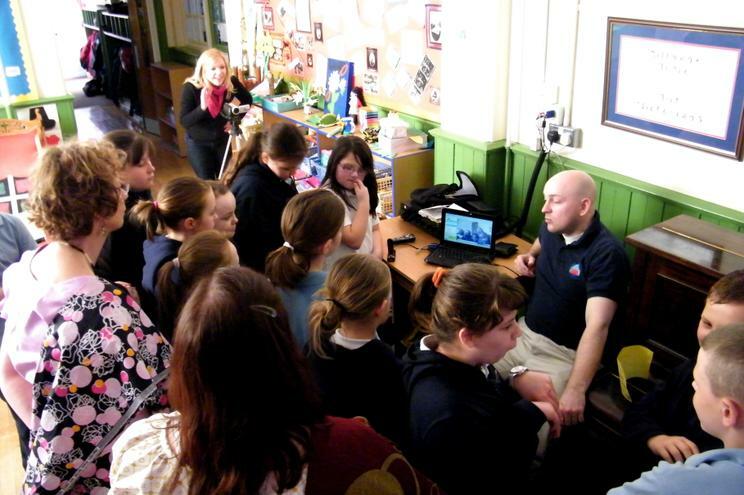 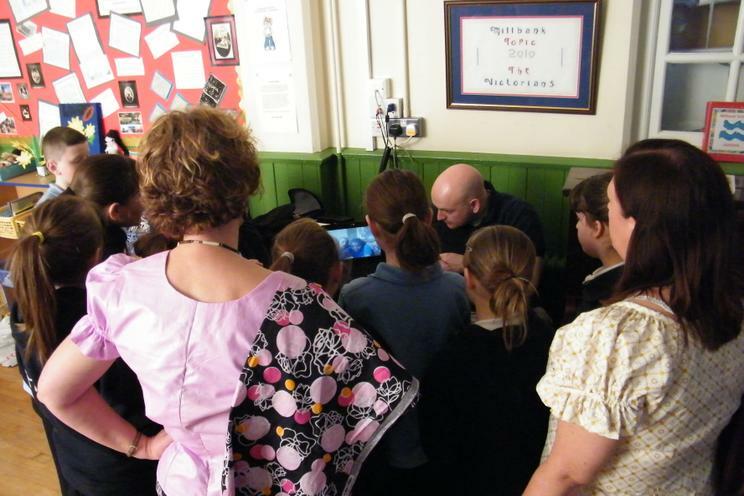 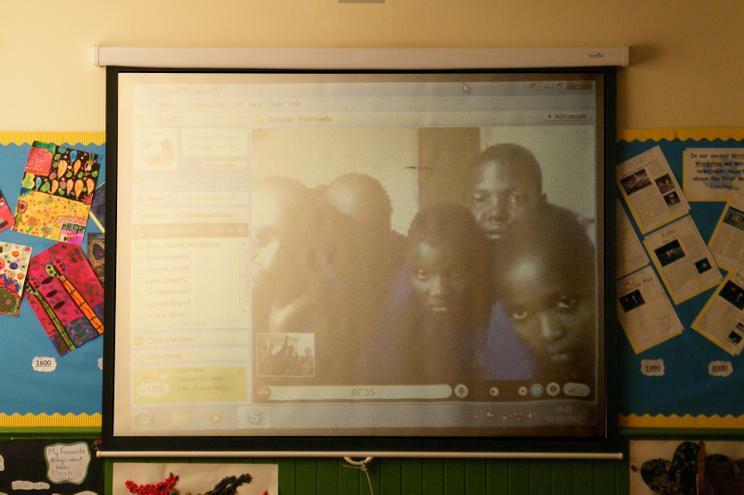 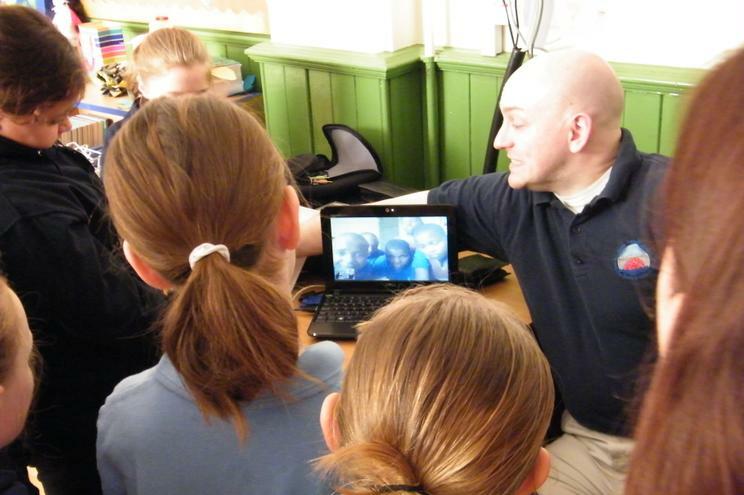 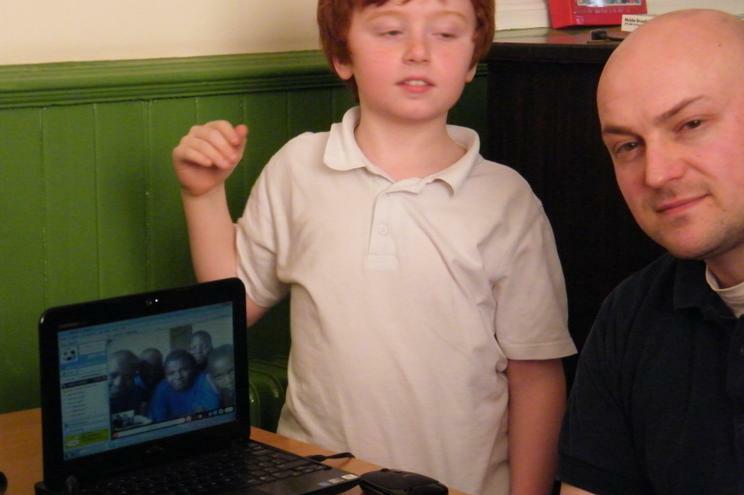 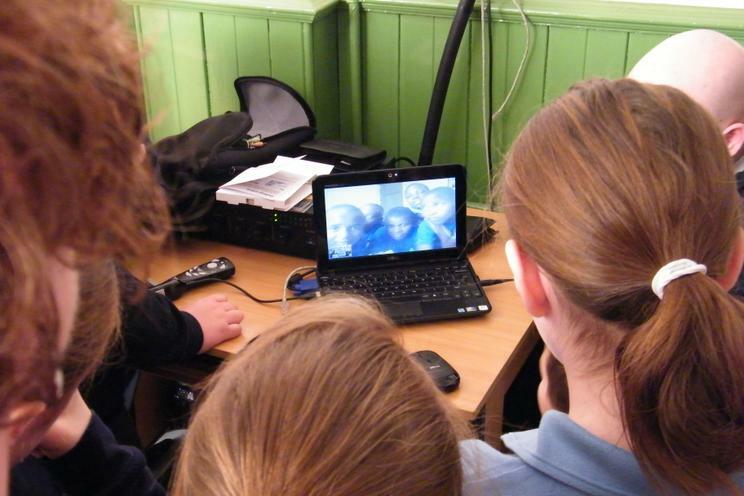 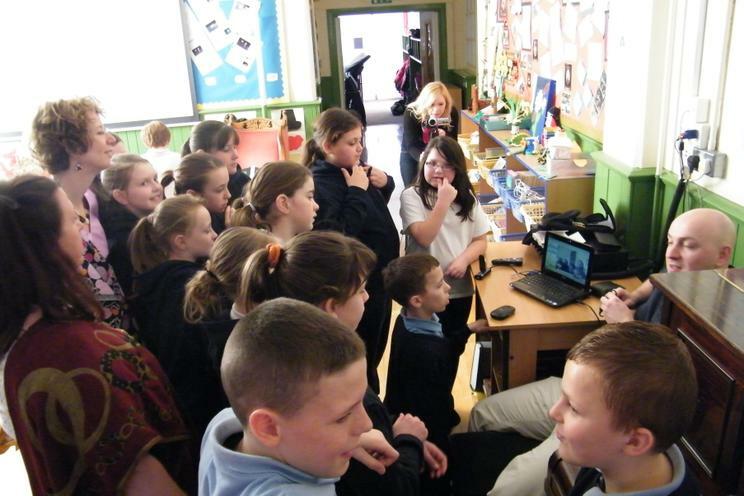 As part of the event we were delighted to be able -eventually- to do a live video conference with school children in Uganda who had directly benefitted from the 'Fairtrade Premium' which had funded the building of their school. 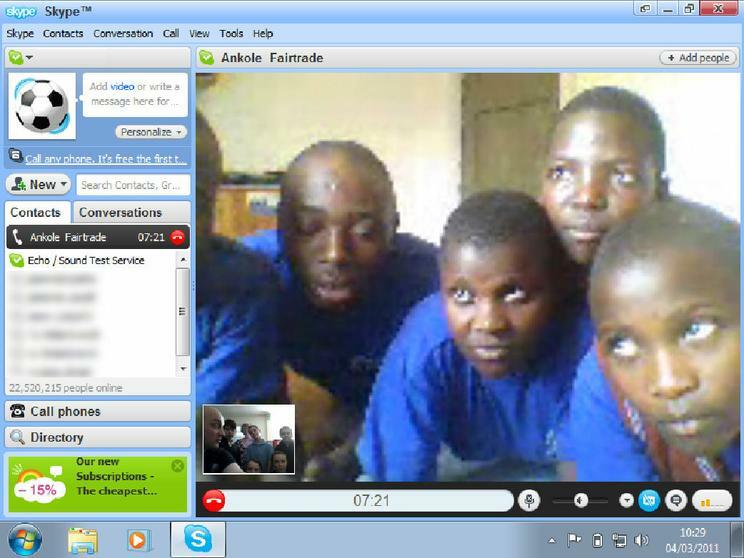 Danielle one of the workers fromFAIRTRADE WALES was out in Uganda and arranged the link for us. 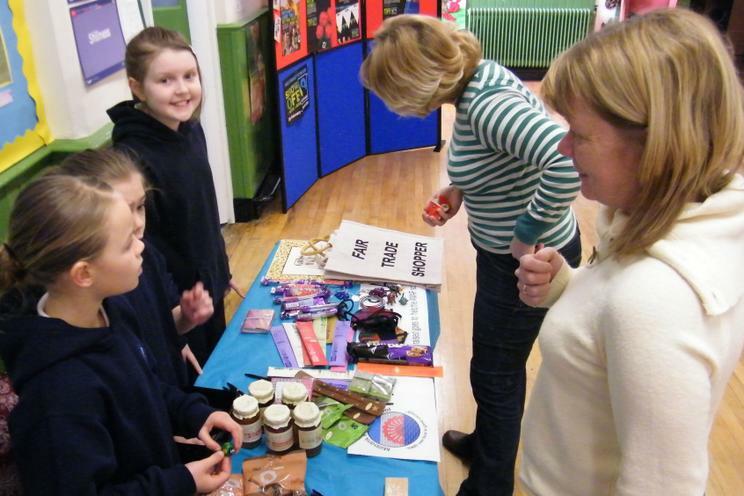 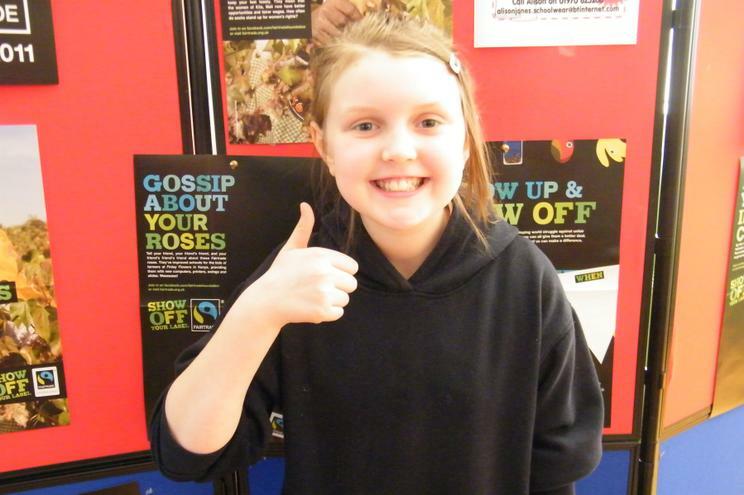 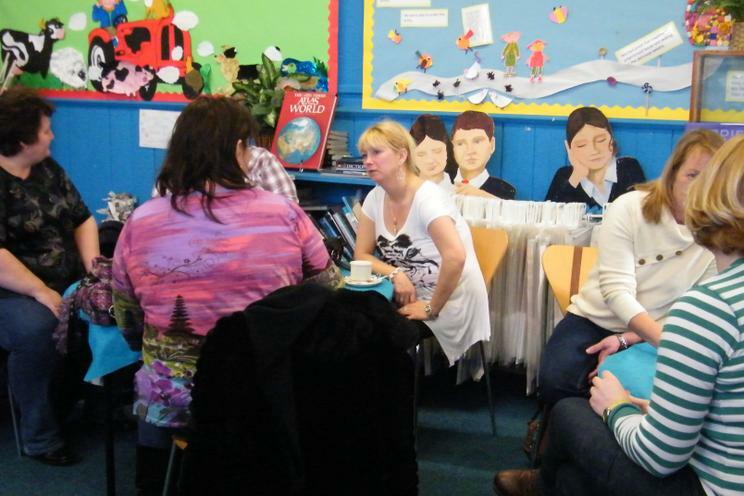 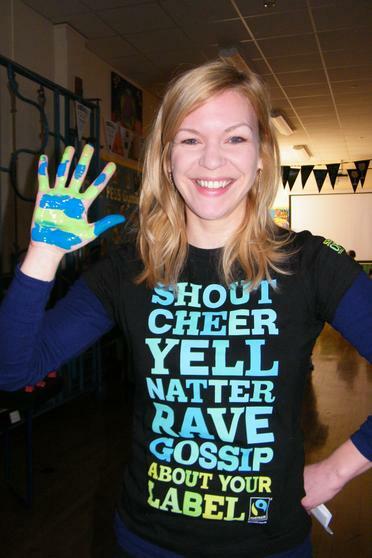 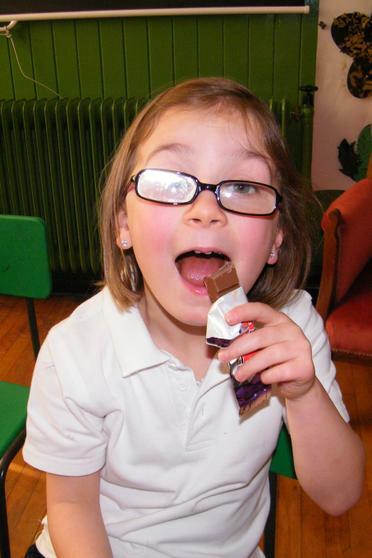 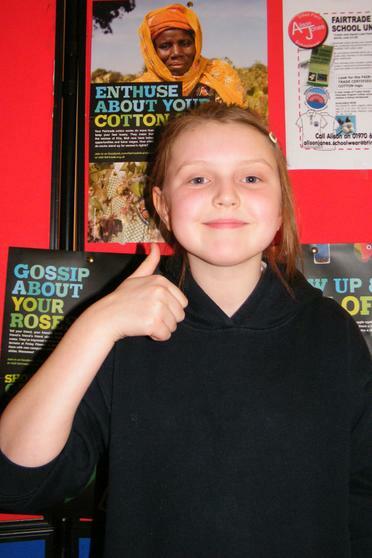 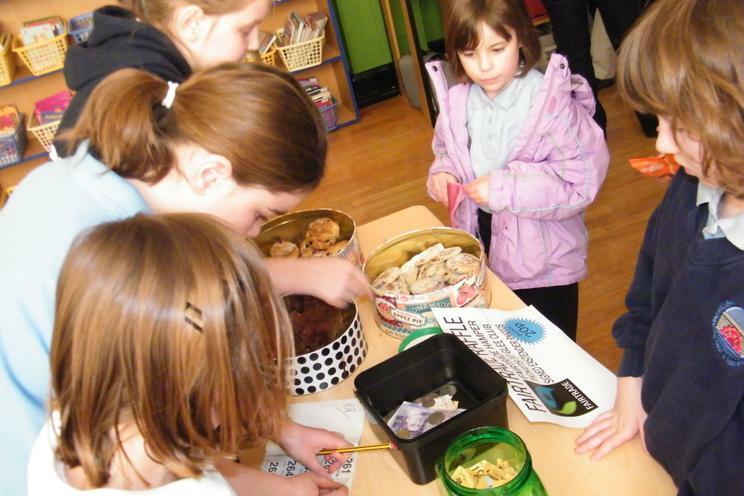 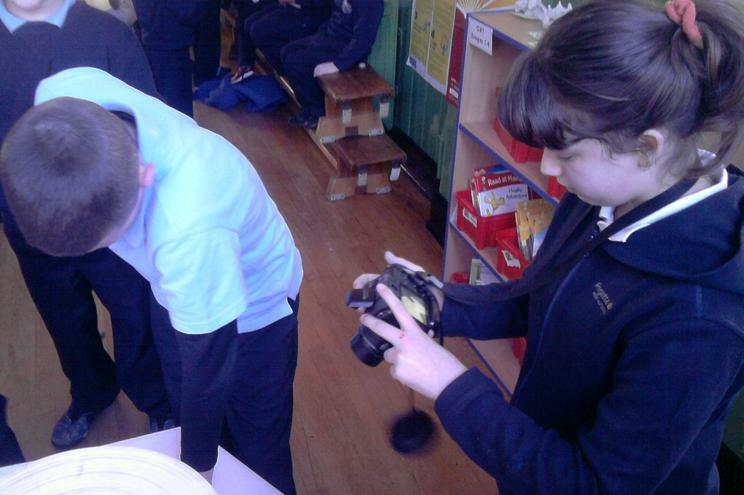 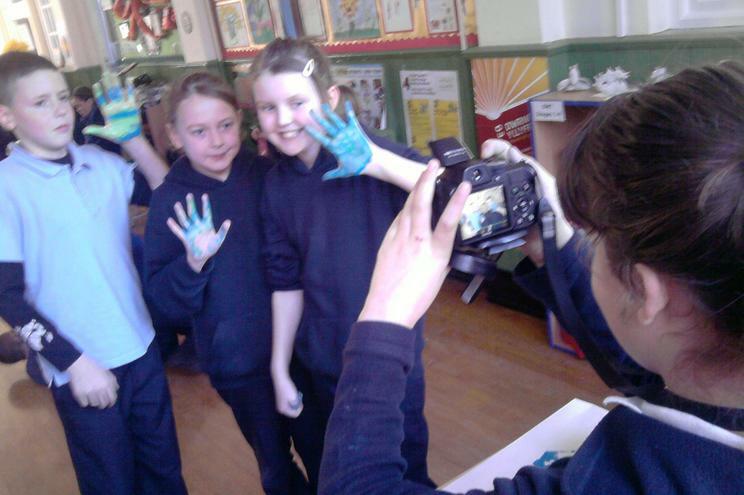 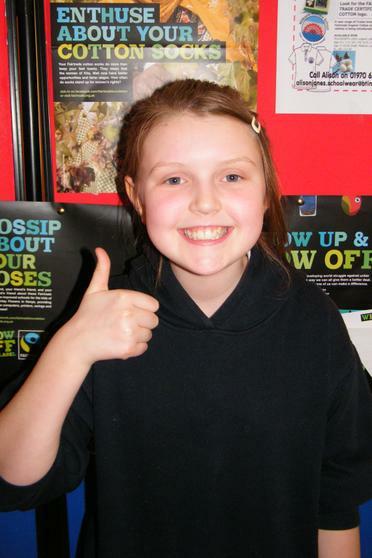 It was great to put faces (and huge beaming smiles) onto the statistics and facts about how Fairtrade benefits. 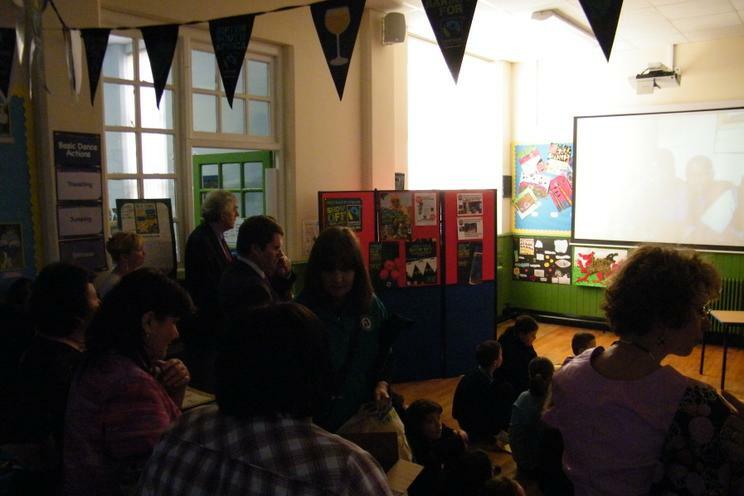 We had hoped that everyone could have a go at the World's Biggest Fairtrade Bunting but demand was so high that we never received the Fairtrade Cotton Bunting - which was a little bit sad but shows just how popular Fairtrade is becoming and just how many people took part, and you cannot be sad about that! 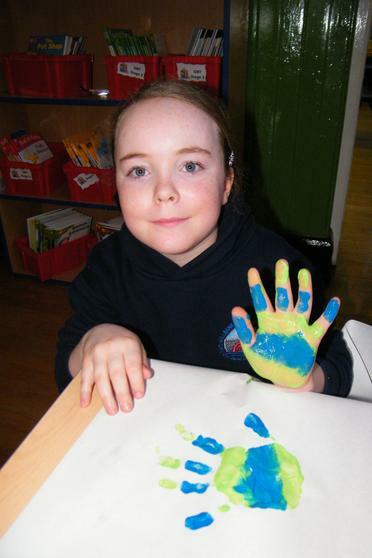 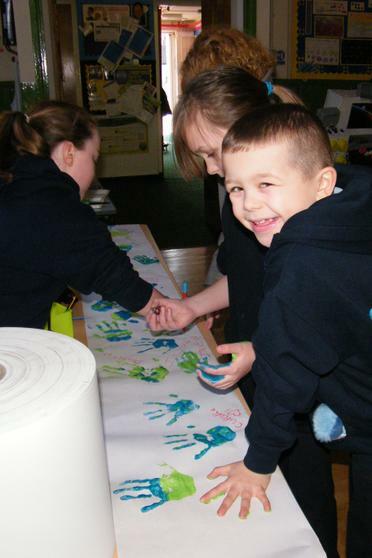 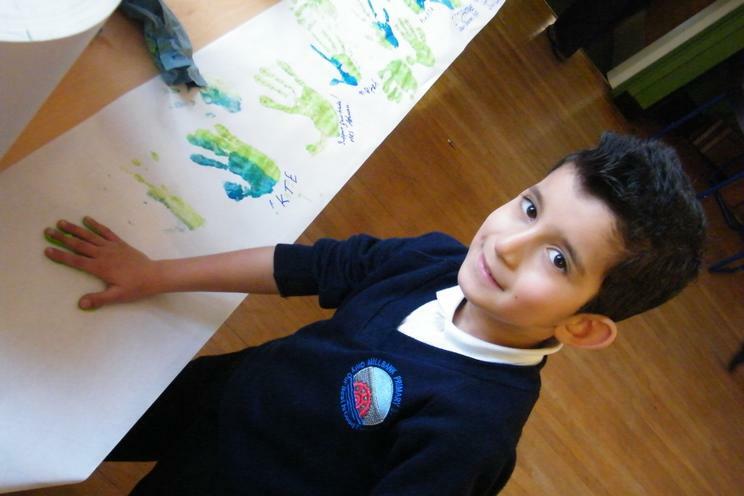 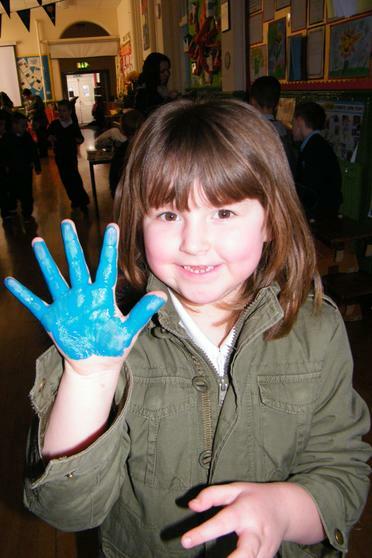 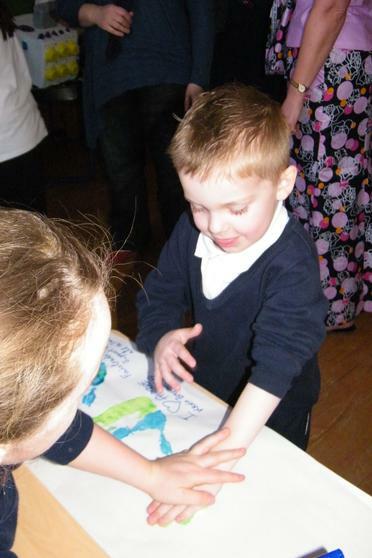 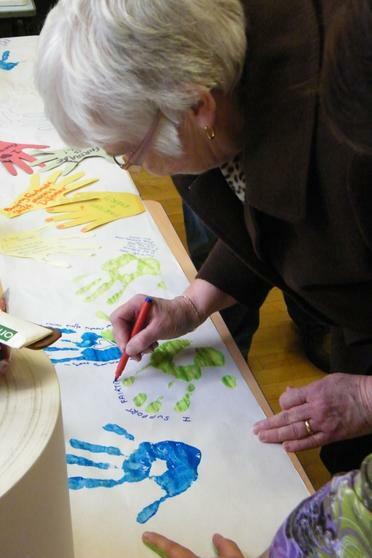 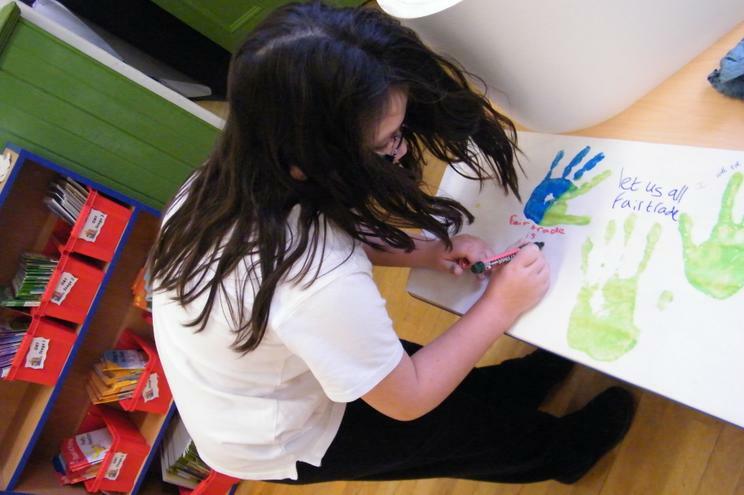 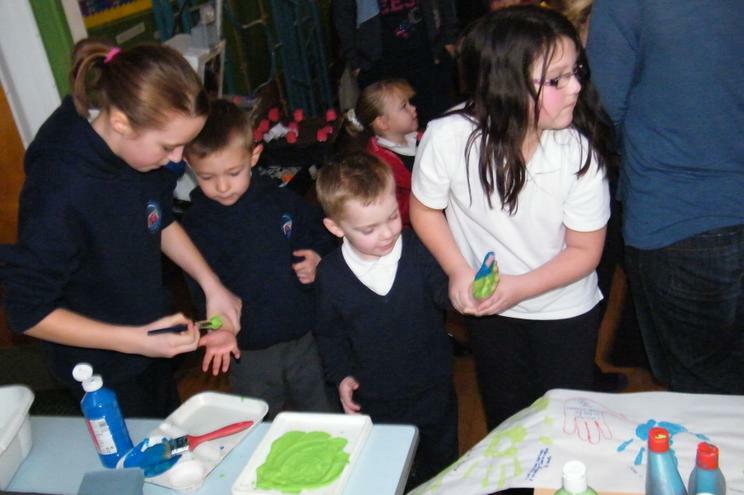 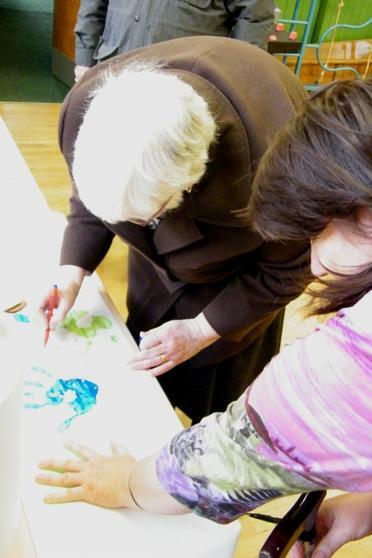 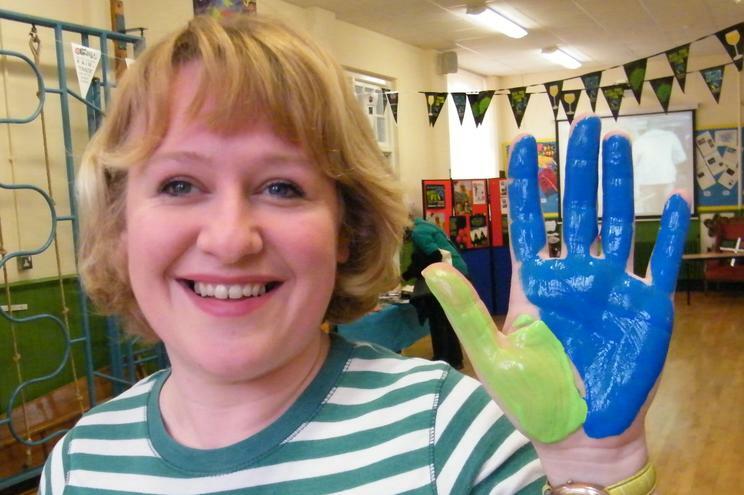 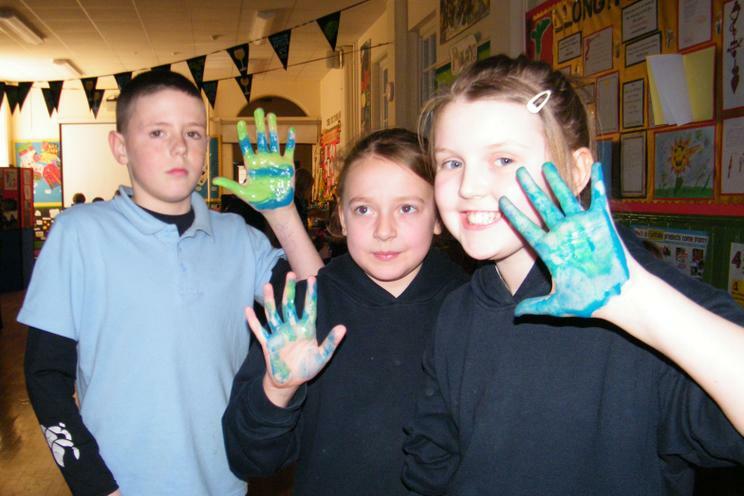 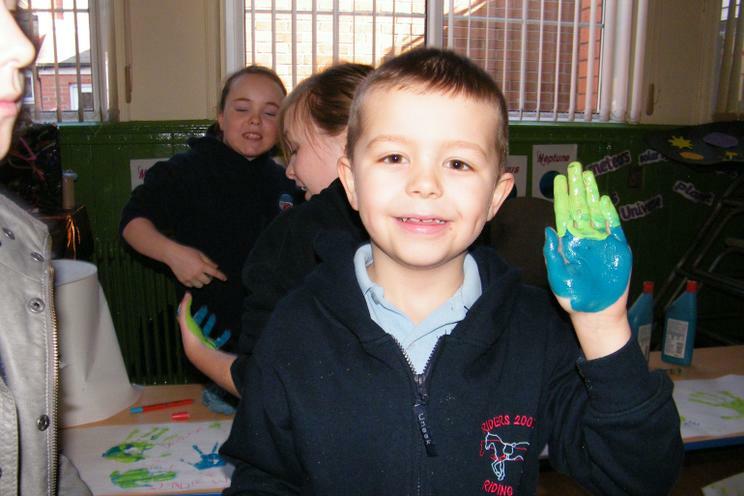 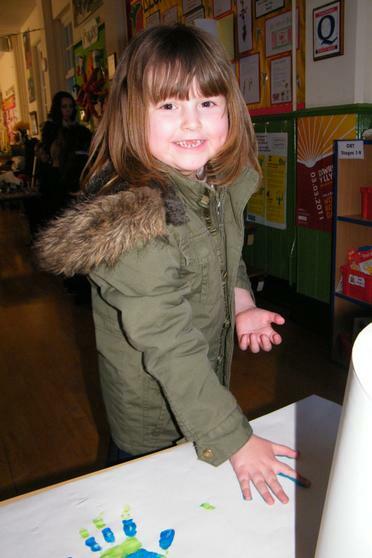 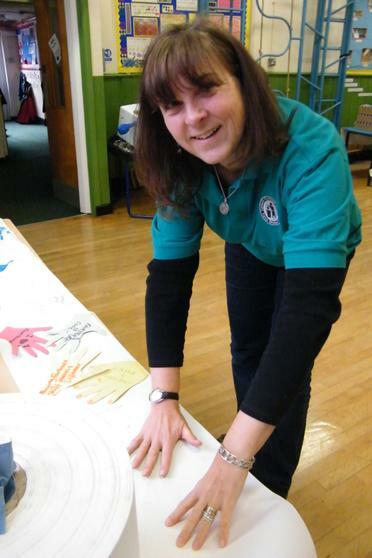 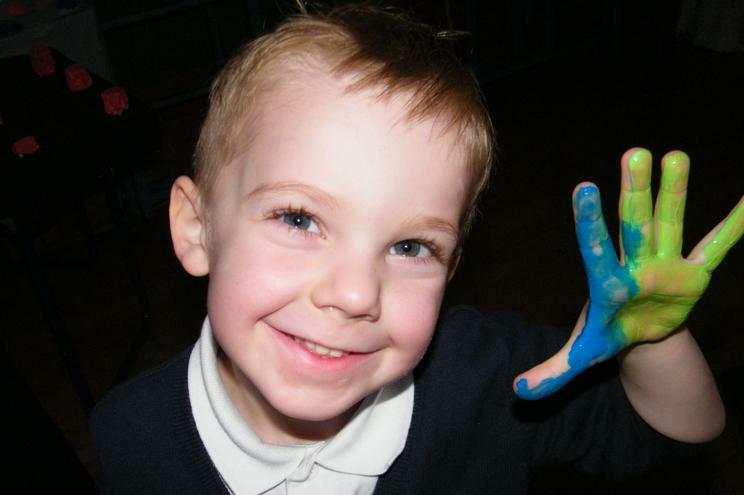 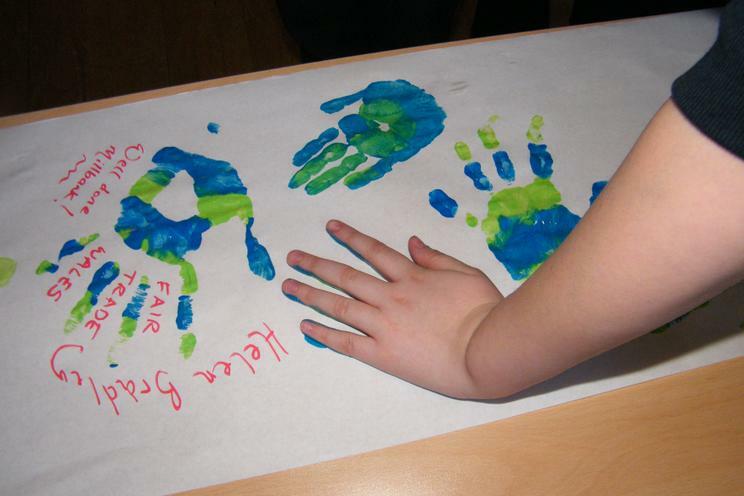 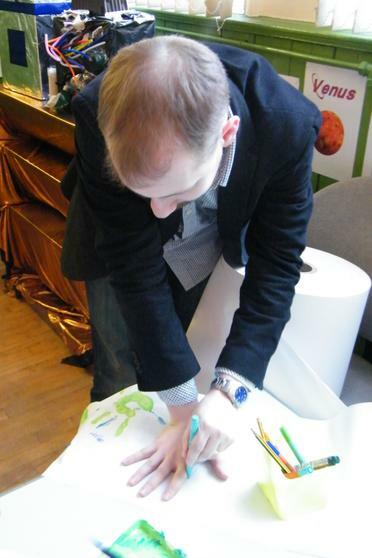 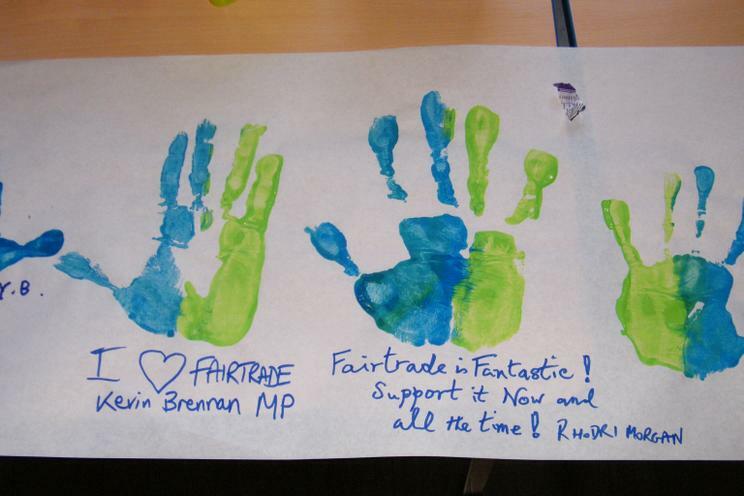 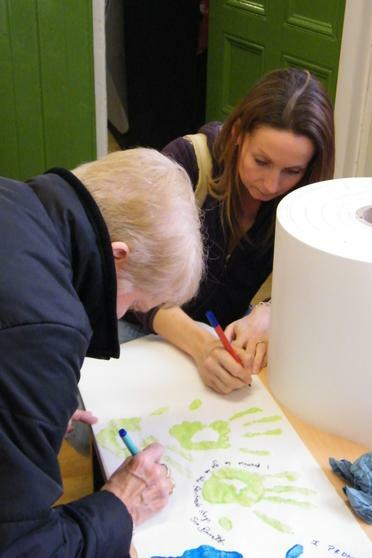 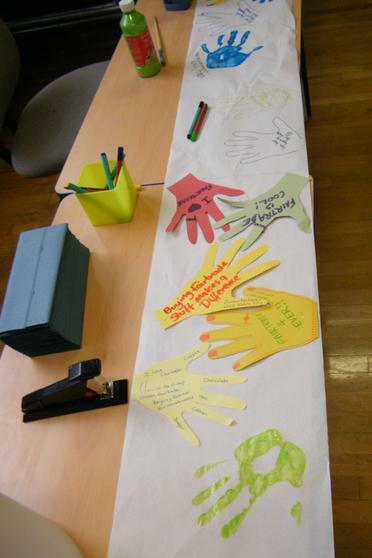 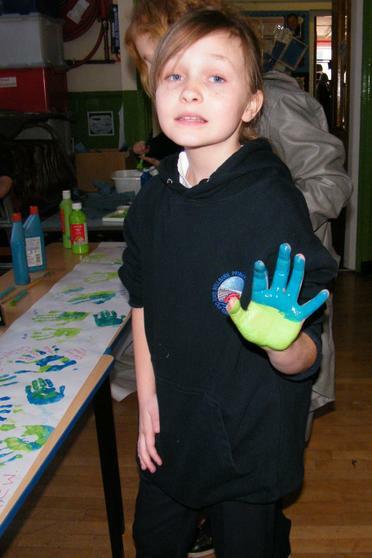 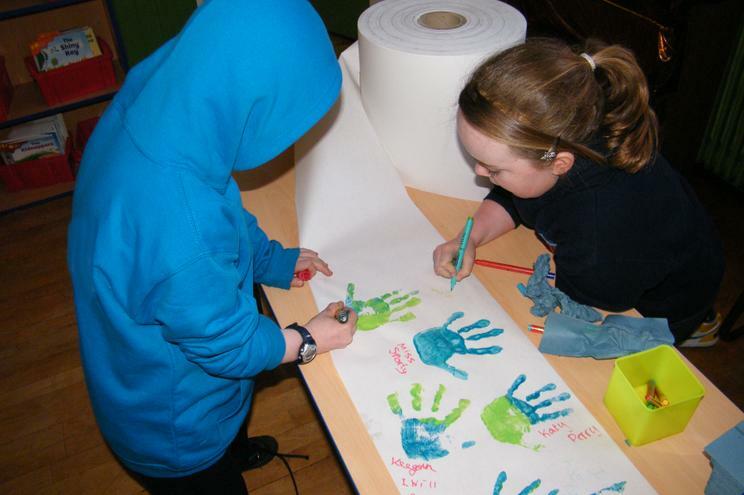 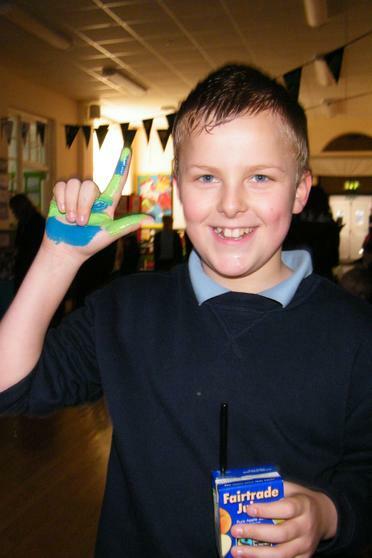 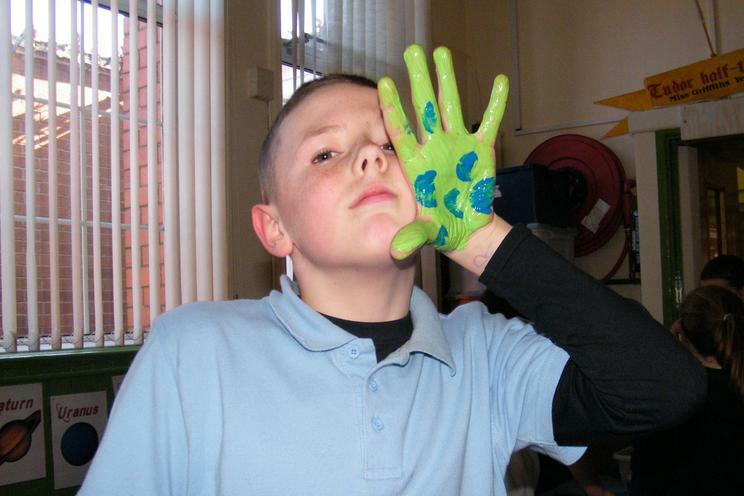 Of course everyone did have the chance to have a go at putting their hand print on our banner which we will keep to show peoples commitment to Fairtrade. 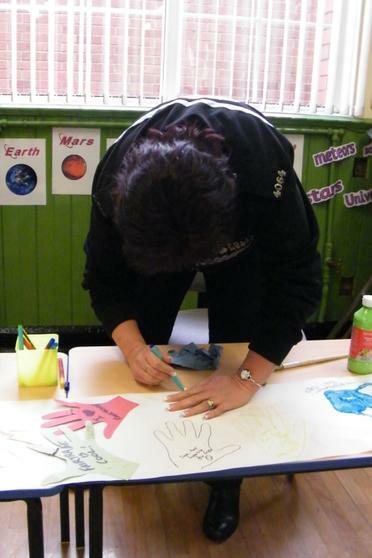 We were delighted with all the messages of support that we received and delighted that people came or sent along handprints for us to add to the banner. 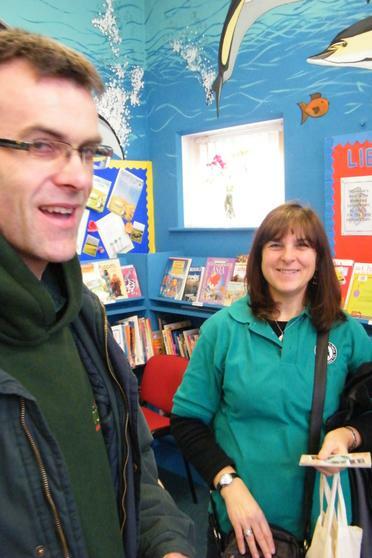 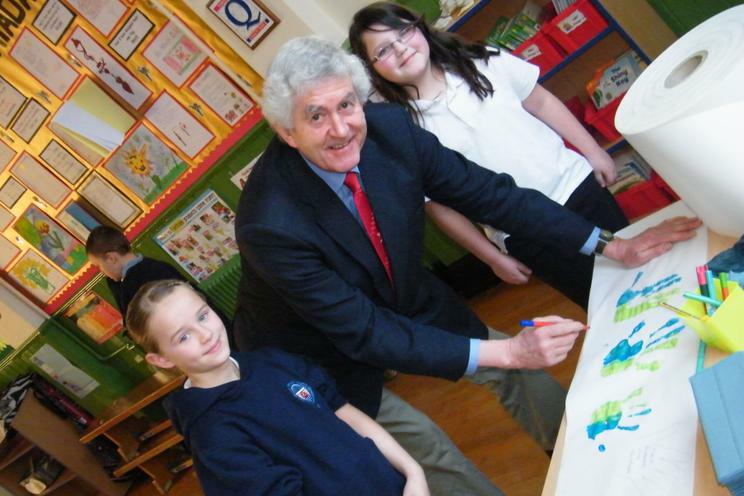 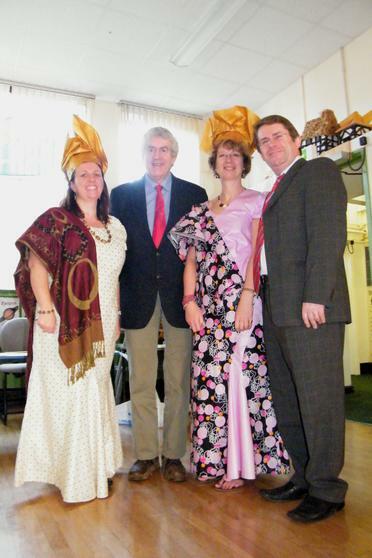 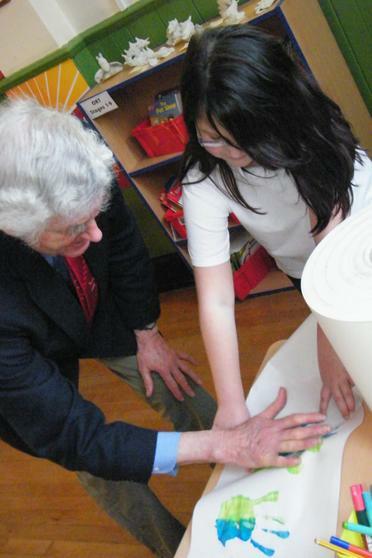 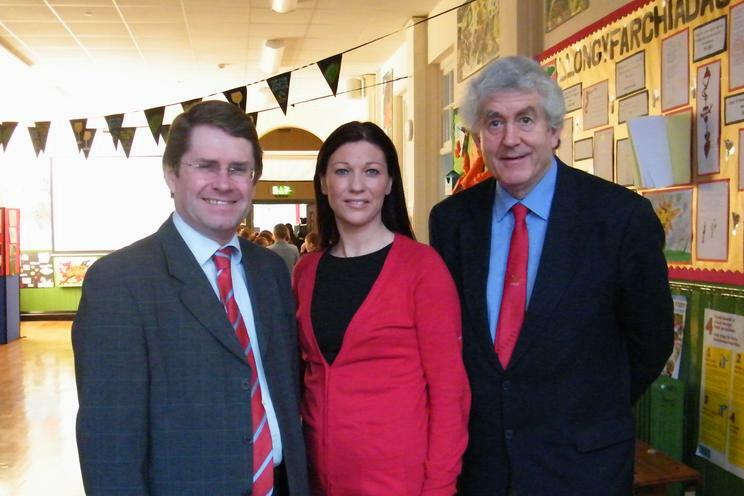 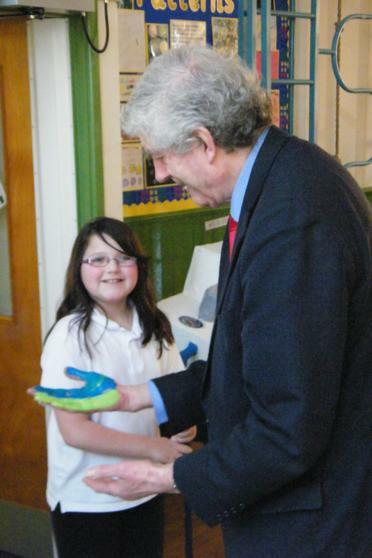 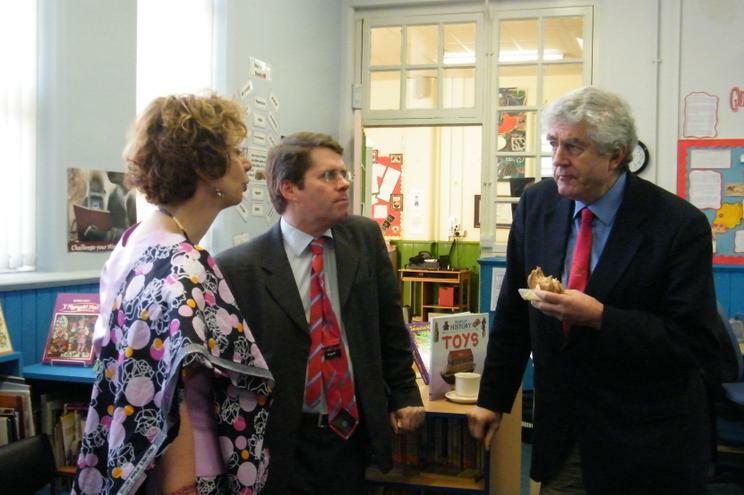 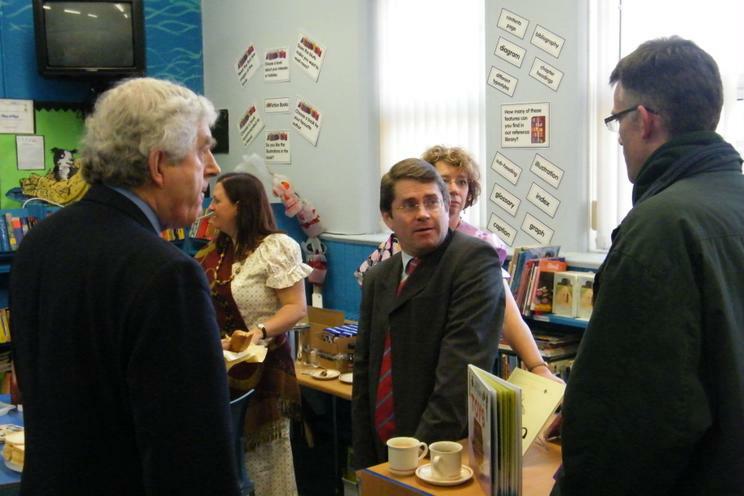 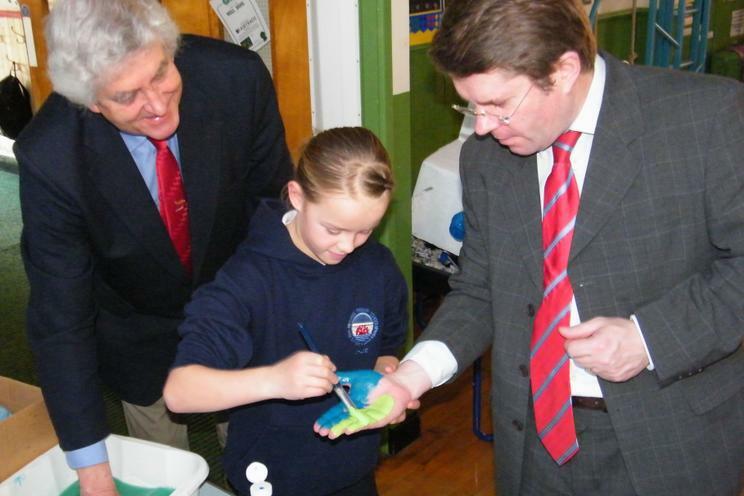 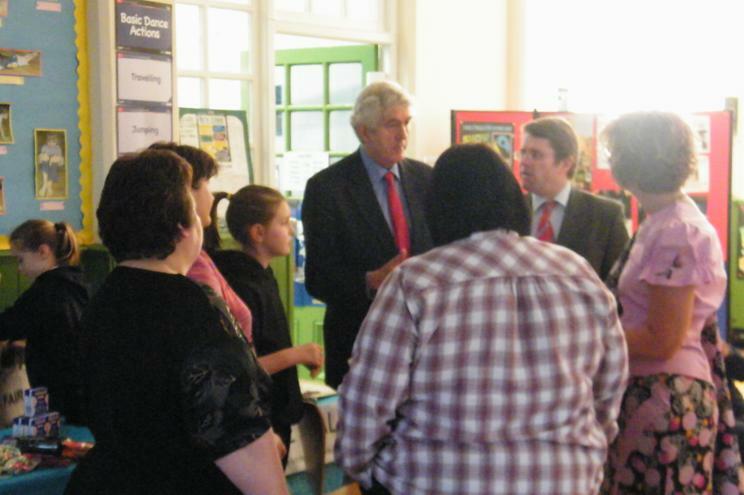 We were particularly grateful that our MP Kevin Brennan and Rhodri Morgan came along. 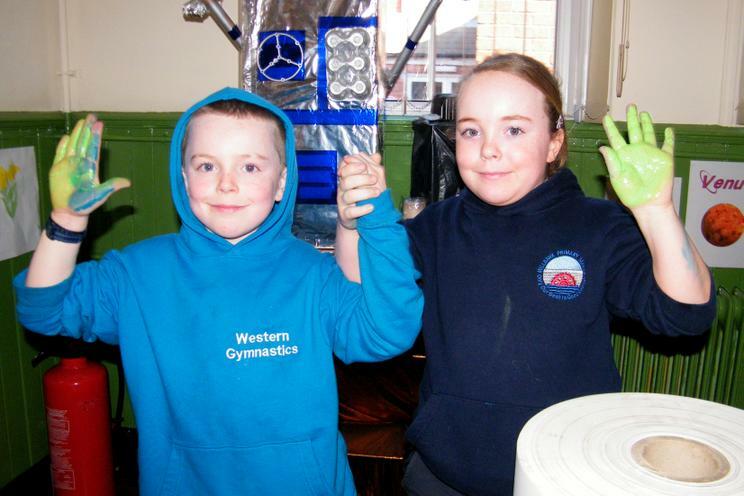 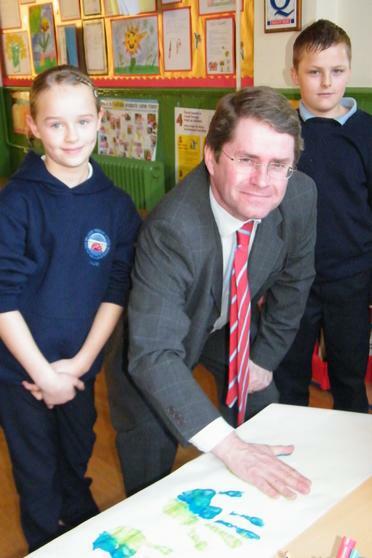 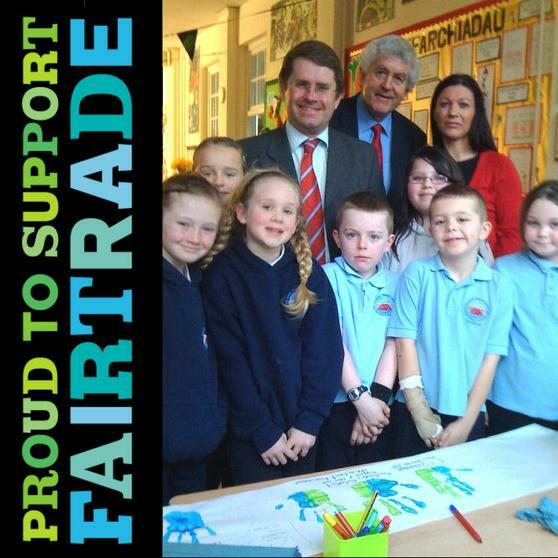 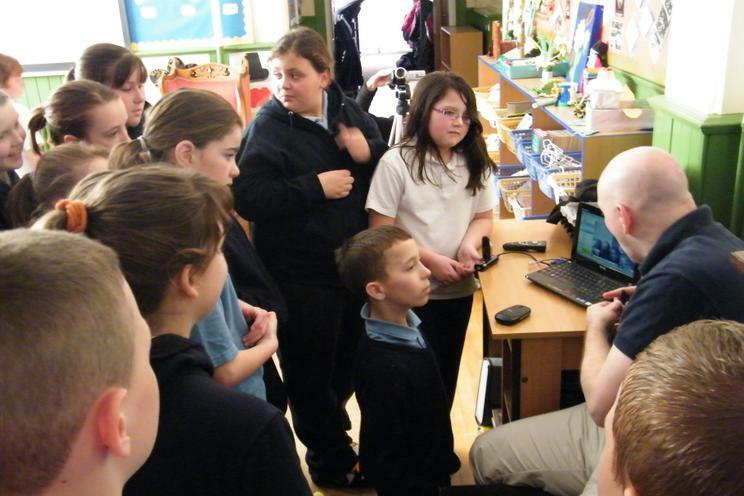 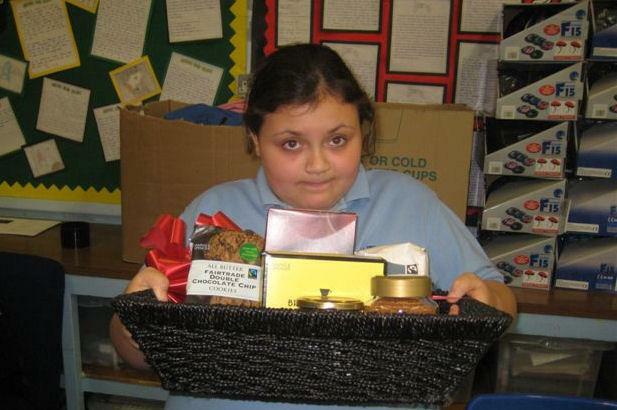 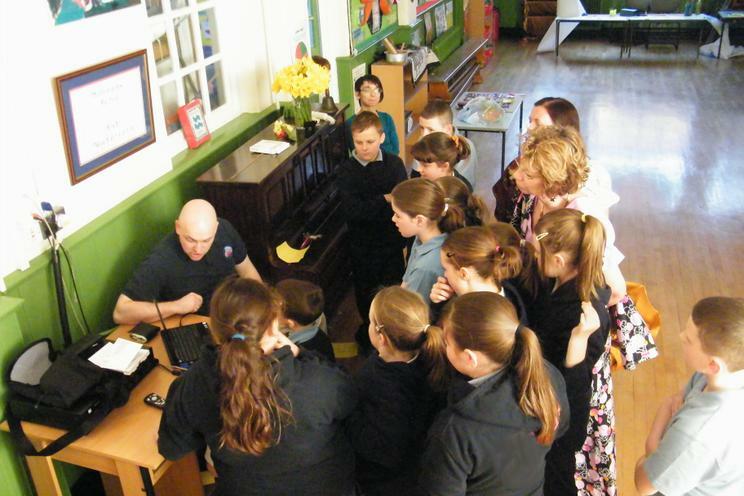 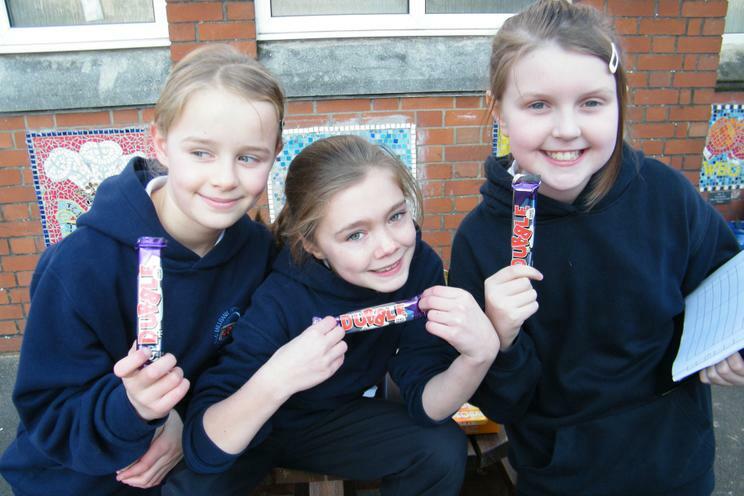 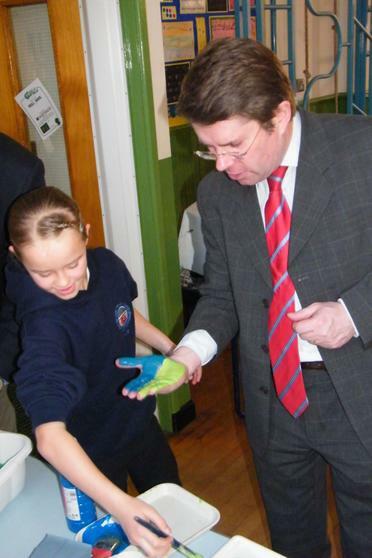 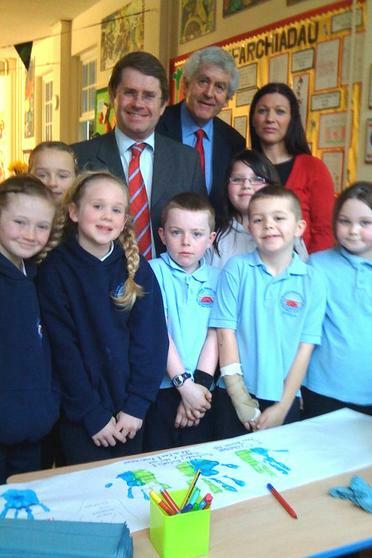 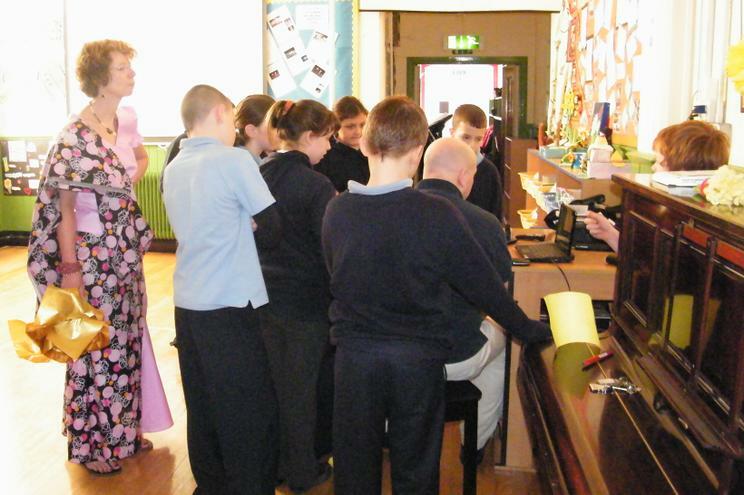 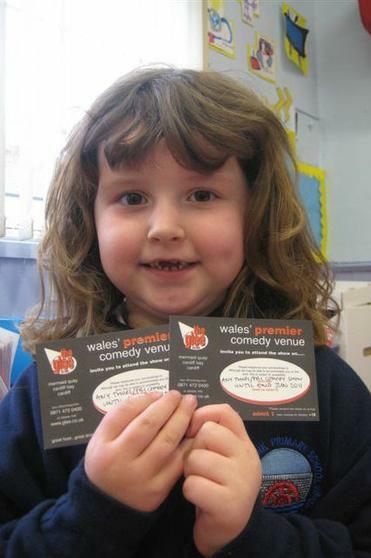 Rhodri had actually launched the FAIRTRADE SCHOOLS SCHEME in Wales in 2007 when he was First Minister. 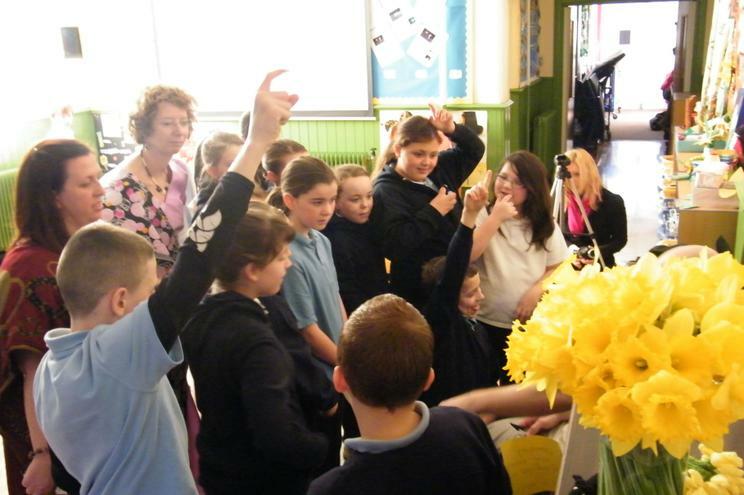 He was keen that Wales would be the First Fairtrade Nation which it of course achieved in June 2008 ( Cardiff had become the First Fairtrade Capital city in 2004). 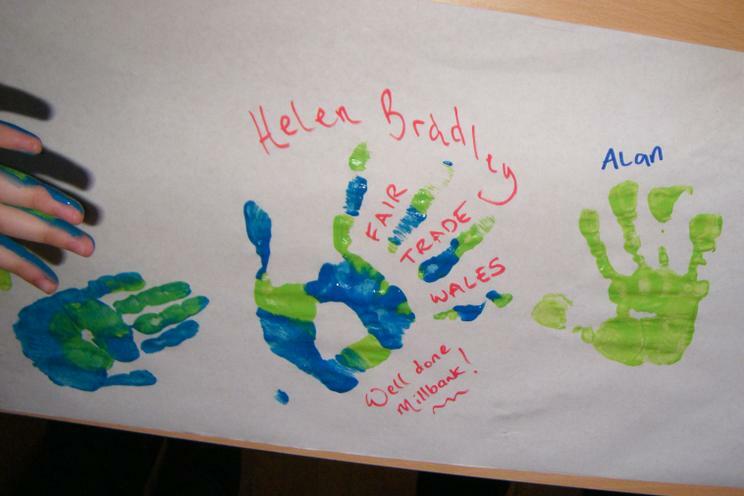 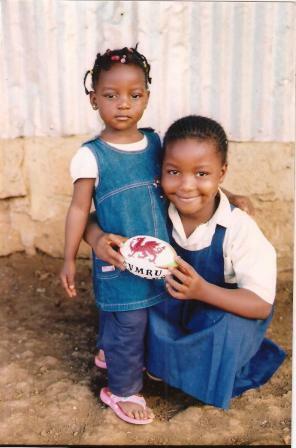 The idea was that Wales could do its part in helping Third World nations if we all bought more Fairtrade Products. 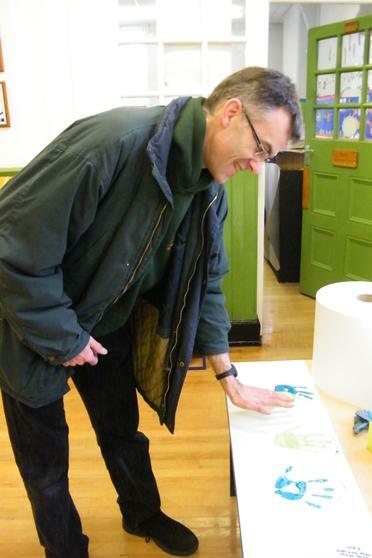 Of course being Rhodri he does not just tell other people to do it he is a very keen supporter of Fairtrade himself and often visits the Fairtrade shop in Canton. 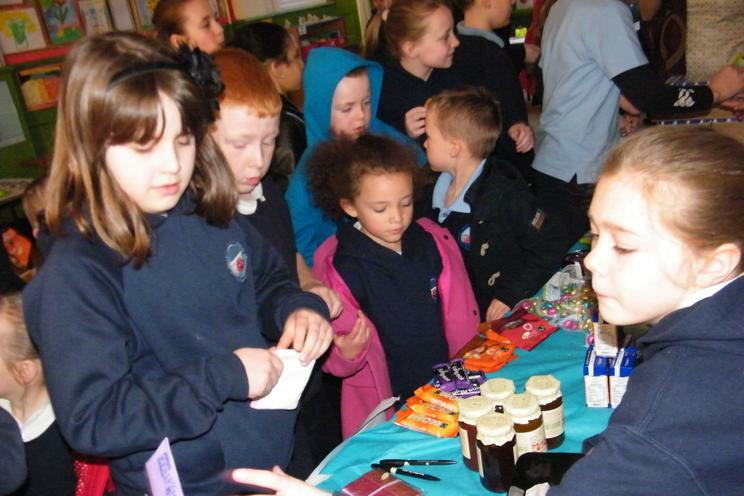 There were lots of posters and postcards and people nominated some businesses and shops for our 'Fairtrade Certificates' which was nice too. 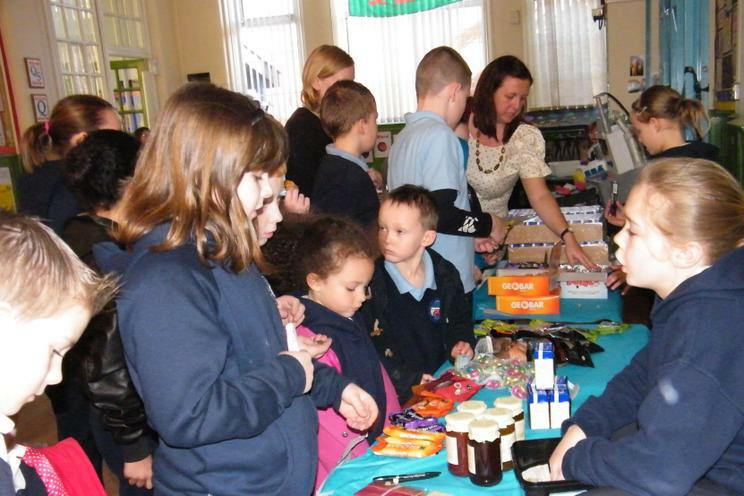 We are really grateful for all the donations we received and the support from parents volunteers and the children who gave up their time to organise these events. 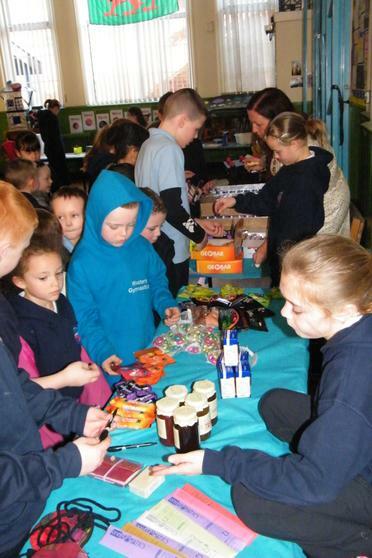 The main purpose of Fairtrade Fortnight is to raise the profile of Fairtrade in our community and I think we certainly did that. 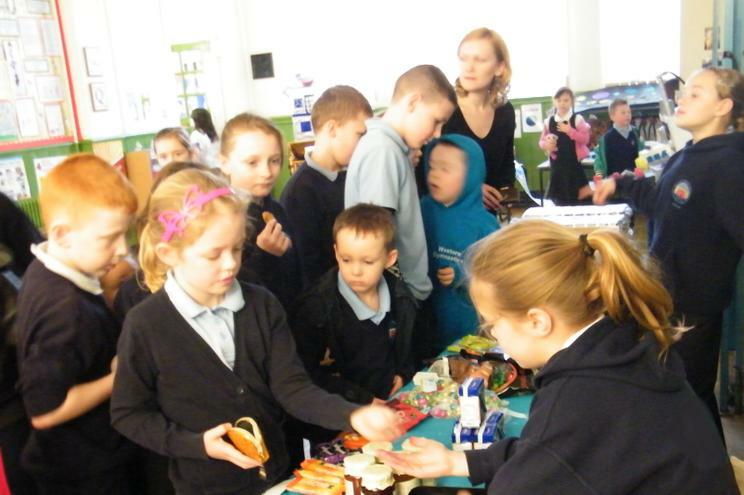 Do not Forget "Together we can make Trade Fair!"